Massachusetts, home to America's best schools and best-educated workforce, has seen income inequality soar. Why? The poor are losing an academic arms race with the rich. "Education then, beyond all other devices of human origin, is a great equalizer of the conditions of men -- the balance wheel of the social machinery." "In America, education is still the great equalizer." BOSTON - When Puritan settlers established America's first public school here in 1635, they planted the seed of a national ideal: that education should serve as the country's "great equalizer." The Bay State is home to America's oldest school, Boston Latin, and its oldest college, Harvard. It was the first state to appoint an education secretary, Horace Mann, who penned the "equalizer" motto in 1848. Today, Massachusetts has the country's greatest concentration of elite private colleges, and its students place first in nationwide Department of Education rankings. Yet over the past 20 years, America's best-educated state also has experienced the country's second-biggest increase in income inequality, according to a Reuters analysis of U.S. Census data. As the gap between rich and poor widens in the world's richest nation, America's best-educated state is among those leading the way. Between 1989 and 2011, the average income of the state's top fifth of households jumped 17 percent. 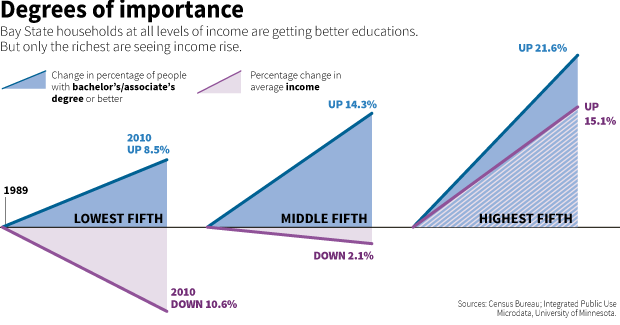 The middle fifth's income dropped 2 percent, and the bottom fifth's fell 9 percent. Massachusetts now has one of the widest chasms between rich and poor in America: It is the seventh-most unequal of the 50 states, according to a Reuters ranking of income inequality. Two decades ago, it placed 23rd. If the great equalizer's ability to equalize America is dwindling, it's not because education is growing less important in the modern economy. Paradoxically, it's precisely because schooling is now even more important. 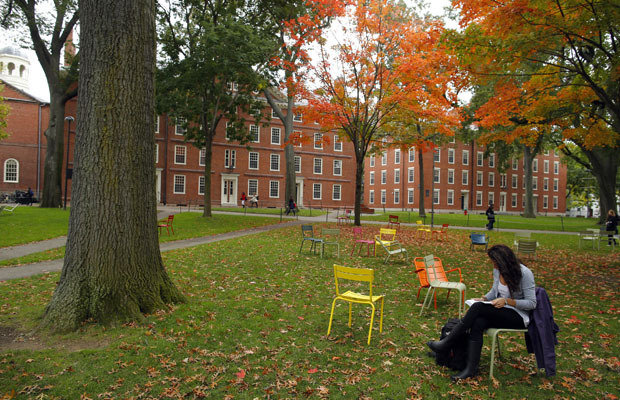 The percentage of Gardner children bound for four-year colleges has held steady at about half in the past decade, and median incomes have tumbled as furniture makers headed south or overseas. Gardner High School graduate Curtis Dorval dropped out of the University of Massachusetts this year after his father, a Walmart worker, ran short of money. He's working at a Walmart now, too, and then heading off to the military. Tanner Skenderian, president of the class of 2012, is now at Harvard; in her graduation speech, she told her classmates to "reach for the moon." Some Massachusetts officials say they fear a vicious cycle is taking hold, in which income inequality and educational inequality feed off each other. Democrats and Republicans agree that the increased disparity is a threat to economic mobility in the state. But as in much of the rest of the United States, they disagree over what to do about it. Democrats argue the solution is more - and earlier - schooling. Republicans believe traditional public schools are part of the problem. The education gap is just one factor behind growing inequality. The U.S. economy has been so weak that large numbers of graduates are underemployed: In 2010, according to Andy Sum, director of the Center for Labor Market Studies at Northeastern University in Boston, only 59 percent of Massachusetts adults with a bachelor's degree were in jobs that actually required one. People are increasingly more likely to marry their educational equal, Sum's research finds, creating well-paid two-income couples at the top. At the bottom fifth, the number of single-parent families has risen 15 percent since 1990. Those parents have lower incomes and less time to devote to their children's schooling. In a pattern echoed nationwide, 70 percent of Massachusetts families with children in the bottom fifth are headed by a single parent - compared with 7 percent in the top fifth. A brainier workforce alone isn't sufficient to drive growth, though. Even as education levels in the Bay State have risen lately, faster growth hasn't followed. Between 2000 and 2010, Sum found, Massachusetts ranked just 37th in job creation. In fact, none of the 10 states with the top students placed in the top 10 on payroll growth. "The best educated states were overwhelmingly mediocre in job creation," he wrote in a study last year. He urges states to complement education with such steps as tax credits, infrastructure spending and on-the-job training. Seventy miles northwest of Boston, Gardner once touted itself as the "chair-making capital of the world." The factories employed thousands of workers who supported large families on single incomes. The first workplace time-recorder was invented here, too; as a result of its adoption, "punching the clock" became part of the vernacular. Today, the factories have gone south or closed. Gardner still calls itself the furniture capital of New England but because of its outlet stores, not its factories. The biggest employers are a hospital and a community college. Retail jobs at Walmart and other chains have replaced better-paying factory work. Between 1989 and 2009, the town's per capita income slipped 19 percent to $18,000. A town of some 20,000 people, Gardner has roughly twice the population of wealthy Weston, but spends just 60 percent as much on education. The town's high school has had six principals in the past eight years. Even kids who excel at Gardner High School increasingly face financial hurdles after they graduate, say teachers and students. Mayor Mark Hawke said cost routinely prices high-achieving students out of elite private colleges. "It happens every day," he said. David Dorval, 47, was laid off in 2009 after working at an area hospital registering patients for 16 years. Dorval, who has an associate's degree, struggled to find work, and he and his wife divorced. Today he takes home $1,000 a month at Walmart in Gardner and pays half of his earnings to his ex-wife in child support. He goes to his 79-year-old mother's house for lunch each day. "I don't feel like I am able to do what my parents were able to do," he said. "My parents were able to support eight kids." That is the flip side of New England's excellent universities: They are the most expensive in the country, according to a study by the College Board. A four-year education at a public or private university costs nearly one-fourth more than the national average. Sticker shock is forcing those who do stay in college to pass up elite private schools for cheaper state ones. That's also happening in the middle-class town of Leominster, a former plastics-manufacturing center 15 miles east of Gardner. Among last year's top students was Eric Marcoux, co-leader of the robotics team and member of the National Honor Society. He was accepted to Worcester Polytechnic Institute, a top private engineering university. WPI offered him a $20,000 annual scholarship - but he and his family still faced taking on roughly $30,000 a year in debt. Marcoux chose the University of Massachusetts Lowell, where he'll have to borrow only half as much. "It was a lot of going back and forth," said Marcoux, whose dream is to work for Google. "It was a hard decision but I think it was the right one." In the state's five wealthiest school districts, students had average scores ranging from 594 to 621 on the 800-point college-admissions test in 2009-2010. In the five poorest districts for which data are available, the SAT scores averaged from 403 to 469. Reville, the education secretary, wants a redoubled push on childhood education: The 1990s reforms were good but didn't go far enough. "There is no way for someone who is poorly educated to be self-sufficient," he said. "It's in our national interest to do something that we should have done morally anyway." Income depends on educational achievement, and the single best predictor of a child's likelihood of academic success remains in turn the socio-economic status of his or her mother, said Reville. The solution to erasing the achievement gap involves, in essence, providing low-income students with the advantages their wealthier peers enjoy: pre-school at the age of three, tutors, summer camps, and after-school activities like sports and music lessons. Schools could contract with outside organizations to provide those activities, or lengthen their school day or school year by one-third. Asked how much such an initiative might cost, Reville responded, "How much would it cost to give every child an upper-middle-class life?" Such talk makes Massachusetts Republicans blanch. They say they care about income disparities that harm people's ability to move up the income ladder. Americans are now less likely to move to a higher economic class in their lifetime than Western Europeans or Canadians, according to a number of recent studies. "What Reville is suggesting is wraparound social services," said Jim Stergios, executive director of the Pioneer Institute, a conservative think tank in Boston. "We think decentralized decision-making in the schools makes more sense." "We haven't closed the (achievement) gap because the Massachusetts curriculum isn't being taught rigorously enough in the urban areas, principals don't have enough power and independence, and there's a cap on charter schools," said Stergios. "That's why we haven't seen the great equalizer working as it should." "In 1940, you wanted to be in an area with resources for your mill," he said. "In 2012, you want to be in a cluster of smart people." Weston, where Glaeser himself lives, is such a cluster. But it isn't for everyone. Its house prices and real estate taxes put it out of reach for most Massachusetts residents, which points up a conundrum. "There are definitely more Westons now than there were a couple of decades ago," Forman said. "What the research shows is that more economic segregation leads to high-income children performing better and better and lower-income children falling behind." The Boston suburbs where Weston is located are home to the most-educated workforce in the nation's best-educated state, according to the Boston Federal Reserve. A Reuters analysis of Census and American Community Survey data found that two-thirds of working-age adults in Weston and surrounding towns had at least a bachelor's degree in 2010. That's more than double the national average of 28 percent. Just 23 percent of their peers in Gardner and its neighbors had a bachelor's or better. As earnings fell in Gardner they soared in Weston. In 1990, Weston residents made 3.5 times more than Gardnerites. By 2009, it was 12 to 1. On a summer Tuesday afternoon, a man was reading a copy of "Horseback Riding for Dummies" outside Bruegger's Bagels, the sole fast-food chain that Weston has allowed to open as it tries, with mixed success, to preserve its historic character. Town leaders say they are struggling to keep the town from becoming even wealthier. "We have three selectmen who are trying to find ways to diversify our population with affordable housing," said Michael Harrity, chairman of the board of selectmen. "It's difficult when lots are selling for $700,000 for teardowns." Those differentials have a long-term impact. An American with a bachelor's degree earns on average about $1 million more over a lifetime than one with just some college, according to recent studies. Gardner High has no parent-teacher organization. In Weston, parents raised $300,000 last year for additional after-school activities in the public schools. Top scientists living in Weston help with school science fairs. Parental involvement is so intense that three parents sit on the interview panel for every prospective new teacher. Stay-at-home Weston mothers attend meetings of student-body leaders and help students organize events. They're known as "Grade Moms". Liz Hochberger, a recent president of the Weston Parent-Teacher Organization, said the town's excellent public schools had become a "self-fulfilling prophecy." Professors from Harvard and the Massachusetts Institute of Technology, along with the wealthy, move to Weston for its public schools, which further improves test scores and college acceptance rates. "Whenever someone is moving to this area and they research the schools," Hochberger said, "this is always on the list." This post originally appeared at Reuters.com, an Atlantic partner site. Edited by Michael Williams and Janet Roberts. David Rohde is a columnist and reporter for Reuters, a two-time winner of the Pulitzer Prize, and a former reporter for The New York Times. Kristina Cooke is a reporter on the Reuters special-reports team. Himanshu Ojha is a reporter on the Reuters global data-journalism team.